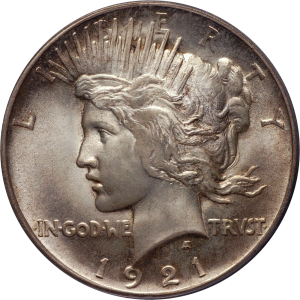 The 1921 Peace Dollar was the first of these fine silver dollars to be issued. The coin was designed by Anthony de Francisci as an alternative to the Morgan Dollar, and in honor of the peace accords following World War I. Because of the Pittman Act in 1918, millions of silver dollars were to be minted and, in 1921, production of the Morgan Dollar, and then the Peace Dollar began. From 1921 until 1928 when the fulfillment of the Pittman Act took place, millions of Peace Dollars were struck.